Libra zodiac sign’s compatibility with the 12 zodiac signs depends on the loyalty and devotion of the partner. Read on to get an accurate astrological analysis and love prediction for Libra compatibility. Librans look for a simple and calm life with harmony in all fields. They do not make up their mind easily and are likely to miss good life partners. Libra needs romance to balance his life but requires the necessary confidence to settle for a partner for life. He is moderate in his exhibition of love and is spiritually connected with his soul mate. He is committed and caring in love. Libra will be turned on by kind and liberal persons who can directly communicate with his heart and share their emotions fully. Leo, Sagittarius and Aquarius make good relationship partners with Libra sun sign. Cancer, Virgo and Scorpio are not compatible with Libra. The zodiac match between Libra and Aries zodiac sign is based on powerful emotions. Aries is rash in taking decisions while Libra decides after due deliberation. Libra is influenced by the opinion of others whereas Aries stands by his own thinking. This Libra compatibility can be achieved by overlooking the crucial differences. Libra man in love is highly indecisive and goes on changing his thoughts and actions. Aries woman is impetuous in love and is not able to handle the state of affairs created by Libra man. On the positive side, Libra by his caring nature can shield the rashness of his mate. If Aries is able to take care of his indecisiveness, compatibility is possible. Both Libra female and Aries man are gregarious people and indulge in intelligent conversations. Aries tends to pick up a quarrel, while Libra lives in her peaceful domain. He is upset by her wavering mind and she is agitated by his violent nature. Both have to overlook the shortcomings of the other person, if they have to coexist. Taurus and Libra like to avoid arguments, and enjoy a peaceful life. They share the common Libra traits of kindness, sympathy and friendly disposition. Minor problems may arise in the relationship, as Libra is outgoing by nature and the Bull enjoys the company of his family. Astrology compatibility between the two is very good as they are passionate and like to spend lavishly. This Libra compatibility with the Taurean is wonderful as they lead a highly passionate and romantic life. Taurus woman is impressed by his persuasive nature and Libra man is carried away by her strong will power. On the flip side, she becomes anxious because of the absence of loyalty on the part of Libra man. For this love match to last, they have to make some adjustments. Both are interested in finer things of life such as music, art and films. She likes to mix with other people but the selfish nature of Taurus man may be an obstacle. The relationship has average compatibility in spite of both enjoying quality time together. There is perfect understanding between Leo and Gemini on all aspects of life. Both are sociable. Libra is highly thoughtful about his mate. Gemini is fascinated by the strong sexual Libra passion. Both are highly intelligent and they always have a very interesting time together. They are highly creative. Gemini woman is outgoing and Libra man is extremely natural. Libra man attracts her by his passion and romance. They admire each other’s liberty. They have to control their spending habit. Horoscope compatibility is strong between the two. This Libra relationship with the Twin is a role model for other lovers as they have a wonderful bonding. Passion and harmony of Libra woman will be the basis for the compatibility. Both are gregarious. Gemini man draws her towards him by his speaking ability and bold personality. On the negative front, both avoid taking decisions. Libra by nature is pleasant and happy while Cancer is grumpy and temperamental. Libra loves social meetings and exciting activities. Cancer is detached and loves solitude and is home bound. In love Cancer sun sign expects attention and expression which cannot be expected from a realistic Libra. Cancer woman is on the look out for affection and security. She tends to irritate Libra man by her constant nagging. This will unsettle his balance. Because of the differences of their approach to love and life, this Libra compatibility is not high between the two. By nature Libra woman likes to squander money and Cancer man likes to keep his money. Cancer man is expressive and touchy while Libra woman is relaxed and light hearted. Both are not concerned about each other. This Cancer Libra friendship may not last long. Both Libra and Leo are interested in love and romance. They also like parties, travels, dining and dancing. Being different in character, they face difficult situations together with ease. As there is harmony in the match, high compatibility can be accepted. The partnership between the Leo woman and the Libra in love is an extraordinary one which can only be dreamt about but is real. Leo female is selfless and dedicated in love and satisfies his craving for attention. Leo women are lucky to have a highly passionate Libra man as their soul mate. Both share their thoughts freely. There is very good love compatibility in the match. Libra woman and Leo man live life to full with lot of passion, adventure and entertainment. They harmonize together in all aspects of living. Leo man is decisive and balances the wavering of Libra. Libra woman likes to shop and Leo man willingly pays for it. Both admire gorgeous things. This Libra compatibility is of the highest order. The Virgo and Libra soulmates have different natures and have difficulty in appreciating each other. The match has many ups and downs in life. Socially both are different. Libra is gregarious while Virgo shuns meeting new people. Relationship may survive if they avoid conflicts by proper understanding. Libra man seeks constant approbation. Virgo woman looks for protection. Libra man is frivolous. The match between the two is pitiable unless they are free with each other. Libra is emotional and Virgo is practical in their approach to life. Virgo is always critical and this may result in extreme dislike between the two. Virgo man is an introvert and does not enjoy the company of people. Libra woman is an extrovert and enjoys mixing with new people. He is cautious and does not express his thoughts freely. As the dispositions of both are opposite, partnership can only survive if Libra woman covers up his deficiencies in character. Two Libra soulmates are jovial, courteous and liberal in nature. They have a charming character and attract people. Their outgoing and happy personality keeps their partners contented. They are very receptive and cannot take decisions fast. Their moods keep on changing. They like creative and intellectual work. They have to maintain their stability for good compatibility. Libra women are very faithful and Libra men are affectionate and caring. Both do not try to control the other person. This Libra Libra love compatibility is average as both have similar characters and at the same time both do not have the traits to keep the partnership in harmony. Libra is clever, pleasant and laid back in their attitude. He is not dedicated in love, like Scorpions. Libra tends to flirt. Scorpion is obstinate and firm. He can be an instructor to Libra on affection and bonding. Both of them like excitement and adventure. They can use their diverse natures to build a happy relationship. Libra man ignores a Scorpio woman because of his pride and flirting nature. Libra man is pleasant and loves to have fun and is a smooth talker. Partnership may be in danger because of the passionate and revengeful nature of Scorpio woman. There can be a deep relationship if both can give up their pride and are understanding. Scorpio man loves Libra female for her attractiveness and virtue. Scorpio man is a passionate lover but his envious nature will be suspicious of the Libran. This will endanger the partnership. Relationship will break up in a short period and will be a memorable one. To be a durable match, immense effort is required from both sides. There is perfect bonding in this Libra compatibility with the Sagittarius zodiac sign. Libra looks for equilibrium and harmony. Sagittarius is an intellectual looking for excitement. Libra is not emotionally stable. Sagittarius is outgoing, naïve and uncomplicated. Sagittarius helps Libra to attain stability but is too childlike to advise correct measures. Libra man and Sagittarius woman as a couple enjoy affection and contentment. Sagittarius woman will support Libra man in his endeavours and the Libra male attracts her with his resourcefulness. Occasionally Sagittarius woman may annoy Libra man by her blunt talk. On the whole, the relationship will be an extremely happy one. Libra woman and Sagittarius man have great affection and appreciation for each other in the relationship. Sagittarius man can keep her in good mood by his eloquence. He conveys his thoughts to her freely. They are held together by strong passion. Libra woman has full confidence in him and keeps him happy by her affection. There exists a heavenly compatibility in this Libra friendship. Libra and Capricorn have different personalities. Libra is an extrovert and is gregarious while Capricorn is a shy and honest person. He leads a simple life with high level of thinking. Dating a Libra means enjoying life to the last minute. Libra puts in lot of effort to keep Capricorn in high spirits but Capricorn cannot communicate his thoughts openly. Lot of endurance and determination is required to sustain the relationship. Libra man enjoys liberty, adventure and social gatherings. Capricorn woman loves loneliness and is an introvert. Capricorn woman is put off by the flirting nature of Libra man. Both have a liking for intellectual and level headed people. Libra man is drawn towards her by her charm and coolness. There is no permanency in the relationship. Capricorn man cares for Libra woman and she supports him in his activities and social meetings. Libra woman is an extrovert and loves fun while Capricorn man is boring and diffident. 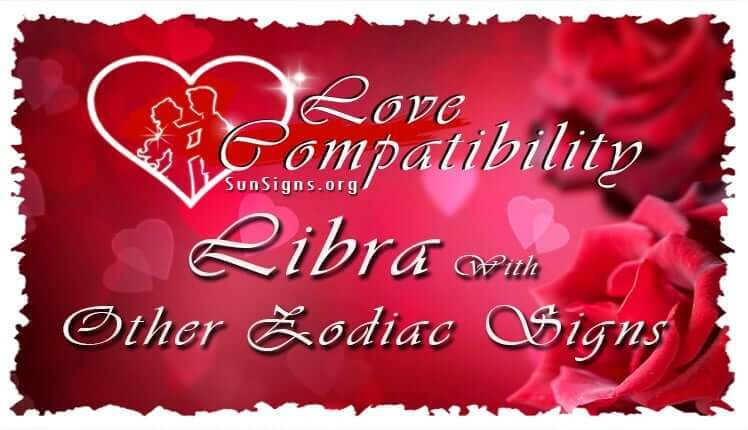 This Libra compatibility is very low in the matching. Libra and Aquarius are extroverts and like to mix with people and make new friends. Both like liberty and their sociable nature makes their company interesting .The pair will be passionate, adventurous and highly compatible. Aquarius will have to keep in check his irresistible temper. Libra man attracts Aquarius woman by his energy and joyful attitude. Aquarius woman charms him by her good looks and intellect. On the negative side, Libra man may irritate her by his swinging moods and Aquarius woman may annoy him by her obstinacy. The match will be powerful and very close. The Libra sexual compatibility with the Aquarian will be passionate and dazzling. Aquarius man is fascinated by her charisma and energy. He will be mad about her and keeps her happy. Both work towards achieving a good bond and support each other in making their lives successful. The Libra compatibility between the two will be very high with lot of love, affection and warmth. Libra and Pisces lean towards imagination and romance. Pisces is always a perplexed and sensitive being. Libra has a relaxed and pleasing personality. Behavior of Pisces makes him grumpy. The Pisces Libra marriage encounters lot of difficulties and misunderstandings, and may end up in disaster. It can be maintained with lot of effort from both. Love between Libra man and Pisces woman starts on a high note initially. Both are sympathetic and interested in fine arts. Excessive emotion from Pisces woman will rattle the cheerful mood of Libra man. Both live in their own worlds and cannot figure out a common place to live together. Horoscope compatibility between the two is insignificant. Libra woman and Pisces man have entirely different approach towards situations in life. Libra uses his intellect to resolve the difficulty while Pisces handles it from emotional viewpoint. Both have common interests in music and fine arts and are also bound by deep love. However, the relationship is doomed to fail.